If it’s your first time travelling, you may be panicking about visas. In many countries around the world you need to obtain a visa (permission stamp in your passport) weeks in advance before entering a country. If you’re going to Southeast Asia and it’s the first time you’ve had to worry about visas, you’ve come to the right place. Southeast Asia is as easy as it gets when it comes to getting visas, with many visa free countries in the region. There are only a few you have to get ahead of time and most of them can be processed in 5 days or less. In other words… don’t worry. Brunei: A free, 72 hour transit visa is available at the border with Sabah and Sarawak (Borneo). If you wish to stay longer, you will need to apply for a visa, costs and lengths of stay vary widely depending on your nationality. Check out the Government of Brunei’s Website for further details. Cambodia: 30 day visas are available on arrival at any land borders and at the airports. If you pay in USD the visa will be a bit cheaper, if you pay in Thai Baht, it will cost you a bit more. Indonesia: A 30 day, visa is available on arrival at the seaports and airports in Indonesia. The cost is $25. You can extend your visa when you are in the country for a further 30 days. For us, we decided to apply for a 60 day visa at the Indonesian Embassy in Kuala Lumpur, Malaysia. That way we didn’t have to deal with extending it while we were travelling around. The cost is 170MYR (about $55). Indonesia is such a massive archipelago that we would recommend getting yourself a 60 day visa. Laos: A 30 day visa is available on arrival at the border and at the airport in Laos. The price of the visa varies depending on which country you are from. When we were there, we stamped in with Australians, Americans, Germans and a Dutch guy…and the Canadians had to pay the most, $62! Malaysia: A free, 90 day visa is available on arrival at the airport and at the land borders. This applies to most, if not all, western countries. The 90 day visa includes Peninsular Malaysia and Malaysian Borneo. Myanmar: You need to get your visa ahead of time. Currently there are no land borders open with Myanmar and its surrounding countries. You must fly there. 28 days is the visa limit in Myanmar, however, you can extend this once you are in the country – for a further 14 days. The best place to get the visa is in Bangkok. See our Getting a Myanmar Visa In Bangkok page for more. Philippines: A free, 21 day visa is available on arrival at the airport. You can apply for a 59 day visa ahead of time at the Philippine Embassy in the country of your choice, or, you can extend the 21 day visa once you are in the Philippines. 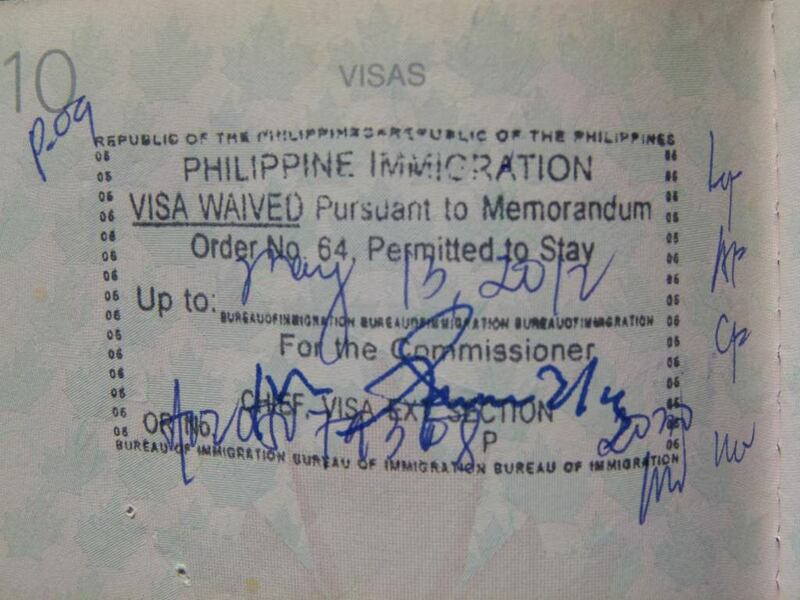 We extended our 21 day visas in Manila and were able to stay for 59 days total in the country. The cost of this was about $71. Singapore: A free, 30-90 day (depends on your nationality) visa is available on arrival at the land borders and at the airport. This applies to all western countries. Thailand: A free, 30 day visa is available on arrival at the airport for most nationalities (all Western countries included). For entry to Thailand by land, a free, 15 day visa is available on arrival. If you want to stay for 60 days, you will need to apply for a visa at the Thai Embassy. Citizens of Argentina, Brazil, Chile, Peru and South Korea are able to stay for 90 days. **UPDATE: As of November 1, 2013 travellers holding UK, US, Japanese, German, French, Canadian and Italian passports are now eligible for a 30-day visa-free entry when entering Thailand by a land crossing. Vietnam: You will need to arrange your visa beforehand. Prior to going to Vietnam, pickup the Vietnam visa at an embassy in the country you are in at that time. If you’re in Cambodia you can just give your passport to your hotel or guesthouse, provide them with 2 passport photos, the cash and they can send it off for you, with no hassle. If you’re in Thailand, there are many agencies that will arrange the visa for you, for a small fee. The visas in Southeast Asia are as easy as booking bus tickets. For up-to-date details, check out the embassy in the country you are applying, then head there during “application hours” (usually in the morning before noon), fill out the paperwork, give them your passport photos and hand in your passport. Then return to get your passport during “pick-up hours” usually between 2:00-4:00 the following day. The times are different for every embassy but often fall around these hours. For the countries that don’t require visas or have VOA (visa on arrival) services, just show up at the border with your passport and receive the visa stamp. For any other questions you can comment below and we should be able to help, we know all the visa regulations currently in Southeast Asia and where to get them. My husband and I will be travelling to the Philippines, Thailand, Malaysia and Indonesia in April. Our trip will be less than 30 days. We want our travels to be flexible so we would prefer to book our flights while in Asia and we know we are ready to leave one destination for the next. We’ve heard that some visas are only granted when travellers can show they will be leaving the country within the visa time period. Do you know anything about this? Will we need tickets out of the country to get our visas? Restrictions about visas are constantly changing. For us, we didn’t have to show proof of exiting the country before we were granted a visa. For Thailand, you receive a 30 day visa stamp on arrival at the airport, for free. For Indonesia, you get a 30 visa on arrival at the airport (for a fee). For the Philippines, you get a 21 day visa on arrival for free. and for Malaysia, you get a 90 day visa for free. If you’re worried about it though, you can always book a flight that has free cancellation and then cancel it 🙂 Or, you can even just have a printout of the itinerary proving that there is in fact a flight on the date you want. We’ve done that before and it definitely works. If you wish to find out more up-to-date information about visa requirements, you can check out http://www.evisaasia.com. For example, Cambodia has a new electronic visa option where you can apply for your visa in advance and without going to an embassy. As for Myanmar, you can also arrange for an approval letter and get your visa when you arrive. Bookmarked! Very informative article! I’ll be travelling to Thailand in November and I never knew about this important information. Thanks for sharing! After reading several websites to plan my trip to Thailand- I have found your site to be the most useful- thanks for all you help. If by chance you have any information to offer as I would like to depart Phuket and travel via bus or train down to Singapore but need to stop at different locations on the way – what is the best route to do this, can I do it on my own or should I book a tour that will include hotels. You can definitely travel from Thailand to Singapore independently. There are trains and buses that you can quite easily take. All of this information can be found when you’re in Thailand. There is a bus that goes from the capital city of Kuala Lumpur in Malaysia to Singapore. Hi there! Do you have to buy a visa if you will only be in that country for a week or so? For example: Should I buy a visa in advance to Cambodia even though I wont be there for 30 days? Thanks!! You can get a visa for Cambodia at the border when you arrive, either by land or by plane. Even if you are only going to spend one week in Cambodia, you will still need to get a visa on arrival. I have a few more questions for you though regarding some border entries. I’m planning to travel from China to most countries in Southeast Asia by bicycle as part of a world tour. Would you happen to know the current process of entry/exit for a bicycle at the border of China and Vietnam/Laos? Should I take a bus to cross, or can I just ride through on the bicycle? This is the most helpful site I’ve found on Visas. Thanks! I was wondering… I was thinking of flying into Bangkok and visiting Thailand and several other countries over a couple months, then flying out of Bangkok. Do you think I’ll be able to do that? Reenter Thailand again after the 30 days is up? I couldn’t find it on the official site. yes, you can reenter Thailand after you’ve left. We did that numerous times during our 1 year around SE Asia and it was never a problem. This may seem a silly question, but I’ve been given contradicting advise. I’m planning on travelling to Thailand, Cambodia, Laos and Vietnam. Do I need Visas for every country or do I only need a visa for my point of entry which is Thailand? We are planning on staying for 2 months, so we have to arranged some of the visas beforehand. Which passport do you hold? It all depends on that. Most likely, you’ll be able to obtain a visa on arrival at the Thailand airport. For Cambodia and Laos, you can obtain a visa on arrival (most likely depending on your nation) and for Vietnam, you’ll need to get it in advance, which you can do in either Thailand, Cambodia or Laos. Thank you for the information, it has been really helpful. Like the lady above I am travelling to Thailand, Cambodia, Vietnam, and Laos, then a return flight from Bangkok to Bali, so essentially I will be entering Thailand 3/4 times. What sort of visa would I require, and will I need a visa for every country? Things in Thailand change at an alarming rate. When we were travelling there, we could re-enter after being out for a month, or two weeks, etc. You can travel to all of the countries you’ve listed by land, without going back to Thailand if you’re concerned about it. My friend and I are planning on backpacking around all of Southeast Asia for as long as we possibly can. With all these limited visas and differences between airport entry and land entry, how would you advise starting or going about our journey? You can get all of your visas on the road. Decide which country you are travelling to first and then go from there. Visas all depend on which country you’re from, but for the most part, you only need to have your Vietnam visa in advance, which you can get in Cambodia. If you want longer in the Philippines or Indonesia than allowed, you’ll need to get that in advance, or extend in country. You can get your Indonesian visa in Malaysia. Is it possible to border hop and get multiple free visas? Is this possible or would you have to extend/pay for the second one? Sorry, see this question’s already been answered earlier! Hi Sheri, hope you are enjoying your trip. My husband and I will also start our long journey this July 2016, anything you have learned this year that could share with us and save us any possible trouble or headache ? we are going to southeast Asia with a USA passport. hi,I’m planning a backpacking to Thailand,Laos,Cambodia,and Vietnam,but unfortunately I lost my passport and I have to make a new one. I’m so worried that I won’t be granted visa to travel to any of those countries because my passport is new. Plus could you tell about the visas in those countries and how are they easy to get or hard because it’s my first time traveling to Asia. Thank you. It doesn’t matter that your passport is new. Which country are you from? Visas for all 4 are easy to get. I am planning to fly to thailand, then head to cambodia, laos, yunnan china, and then to burma and india to nepal. i plan to do all this hitchhiking/by land. I have a US passport and my friend is from poland. we are mainly concerned about land travel to burma, getting a visa for india, and getting a visa for china. what do you think? You will need to get your Myanmar, China and Indian visas before arriving in-country. You can apply online or in the embassies. All prices are quoted in Dollars. Should I bring some dollars in cash with me on my travels to be able to pay for these things? No, that’s not necessary. You can use your ATM bank card. We do suggest having about $200 on you though just in case your card won’t work one day and you’re stuck. I believe the price of a Laos visa is $42 USD and yes it is an expensive one; your article has a price of $62. What nationality are you? As Canadians, we paid $62, so it would be good to know if it’s less now! Please have a look at job boards at dave’s esl cafe.com, transitionsabroad.com, tefl.net, etc. good luck! How can somebody get visa from Kenya to travel to Canada, Asia , Australia etc ? As in, you are Kenyan? Im going to India (flying into New Delhi) from Myanmar, was wondering if you knew how i could get my visa for that? Malaysia nd SouthAfrica were is Good to Struggle am From Nigeria? I am 15 days away from departing Canada for a 4 month adventure through Southeast Asia, and I’m facing some confusion concerning visas and how it all works. I fly into Thailand and intended to travel North to South, then go into Cambodia, Mayalsia, and finish in Indonesia. My biggest question is, do I need proof of exit to get onto my China Airlines flight? Also, if I were to be out of Thailand for a month or two and desired to return, would I be able to re-enter with another 30-day visa? This information is very helpful, thank you. I was just wondering if its all up to date? I have heard that visa control regulations can change quite often. Nevertheless you have definitely calmed my worries. First I want to say I love the site and find it extremely useful! I am a permanent resident of USA but still hold a passport from Ecuador. How does this change my situation regarding visas to travel in south east Asia? But I was told that if I don’t have or my return ticket is more than 30 days away they will not let me in the country. Wandering what the best way to travel around South East Asia is preferably starting in Thailand (but open to ideas) and what (if any) visas I will need? If you fly into Thailand, you must have proof of an exit flight. You can actually book this flight and use it, or, you can book it and then cancel it, but print off the confirmation before you cancel it 😉 From Thailand, you can then take buses or trains or whatever to your next destination. I think you have answered my question in this post above but I want to make sure I understand correctly. I am planning a 6 to 8 month trip to Southeast Asia. I would like to buy a round trip ticket flying in and out of Bangkok. Everything I have read accept what I see posted here is that I have to have an outbound ticket from Thailand to get in with a 30 day visa. My outbound flight will be 6-8 months later, so how do I get around this issue? My plan is to spend 30 days in Thailand, then head to Cambodia for 30 plus days. I then want to spend at least 2 months in Vietnam and another month in Laos. Finally, I will be heading to the Philippines for at least a month before heading back to Bangkok to head back to the states. Any suggestions on this subject will be great! Yes, you’re right, you will need to show proof of a booked flight out of Thailand. Normally, you will have to show this when you check-in for your flight actually – in whichever country you are departing from. In the past, we have booked a flight that was able to be cancelled. So, we would literally book the flight with a booking engine like Expedia or something, and then print out the flight itinerary, and then cancel it right away. Look for one that you can cancel without any fees. You can book a flight from Thailand to Cambodia (for example), and then print that ticket off. After that, you can cancel it 😉 But, make sure you book with a company that has free cancellation! Or, you can book a legit flight. Check out cheap airlines like AirAsia.com Good luck! I’m planning on backpacking Thailand, Cambodia, Vietnam and back to Thailand. I was going to apply for a visa to Vietnam beforehand, but based on your information, it seems like I can just apply at my hotel/hostel in Cambodia before heading over to Vietnam. Is this right? And another question: I’m initially flying into Bangkok. I have a total of 32 days of travel in SE Asia, with a plane ticket out of there, leaving from Bangkok. I know I get 30 days visa, but is that 30 days from when I arrive, or 30 days total, or do I get a new visa upon re-entry? I don’t want to be denied a visa back to Thailand when I need to get back to Bangkok for a plane out of there. Things have been changing a lot in Thailand lately. The 30 days starts when you arrive at the border. So, when you re-enter into Thailand, you will be given another entry stamp. I have just read these rules however: http://pattayatoday.net/news/latest-edition/new-visa-rules-2016/ …are you returning to Thailand by air or land? Also, becuase you have a flight out of Thailand, you should be fine (it’s proof that you are leaving). But, to be safe, I would contact the Thai consulate / embassy in your country. Here is some more information: http://www.thaiembassy.com/thailand/new-visa-rules.php. I think you will be fine, but double check. hi! i am holding a philippine passport.i will travel from manila to bangkok to cambodia to saigon then back to manila. all transfers will be by land. as filipino passport holder, we dont need visa to this countries, but im not sure if same case is true if its land border crossing, especailly upon entering vietnam. do i need to secure something before our trip, or just go straight to the border and have my passport stamped? thanks! Hi Erin, I recently read on another site that to get the visa exemption you can book a flight to thailand and then use an land or sea transport ticket to exit Thailand (i.e. bus, train, boat) and the boarder control at the Thai airport would accept that and this method was a useble alternative to the “book a return flight and cancel” method. Also wondering whether my airline would accept this as mentioned above many reject single ticket fliers? Do you have any experience or literature to back this up? I don’t want to buy my boat ticket and then be detained at the Thai airport and sent home. Sorry another one for me; I’m Going to all the countires listed (over 12 months) in an anti-clockwise loop starting in Bangkok. I’m a UK citizen and also have a sister in Singapore if you can think of any ways that second bit could help me. I am flying into Thailand, and flying out 6 weeks later. Planning on travelling to 3 other countries in the region, but if I am only granted 30 days, can I get back into the country to fly out? So I guess the question is can I get a second visa a month later? what about traveling with a felony conviction? not drug related. Could anyone give me some advice on what visas I will need to get please? We will be going on a cruise in South east Asia ( Hong Kong to Singapore ) in January 2018. We will spending two days in HK and 2 days in Singapore at either end of the cruise as well as an independent overnight stay in Bangkok during the cruise. Will we need any visas and if so how can we obtain them, preferably before we travel? We are planning a trip for 3 months across Thailand, Laos, Vietnam, Cambodia, Malaysis etc. My questio is, we land in Bangkok and will have moved on before the 30 days are up, but we plan or returning a month and half later, will we just have to repeat the process of the visa or is there a different rule upon re-entering the county so soon after leaving? I got a invitation for investigative journalism conference in South Asia. We don’t have any embassy in bangladesh. So what can I do ? I’m flying to Vietnam. Flying from Vancouver, BC, Canada and flying to Taiwan than to Ho Chi Minh, Vietnam. How do I arrange my visa? I have an Iranian passport but I’m traveling from US. I was just wondering if these rules are true for me as well. Just worried I am going to have problems.